I was looking for a fall inspired dish to mix it up for dinner. 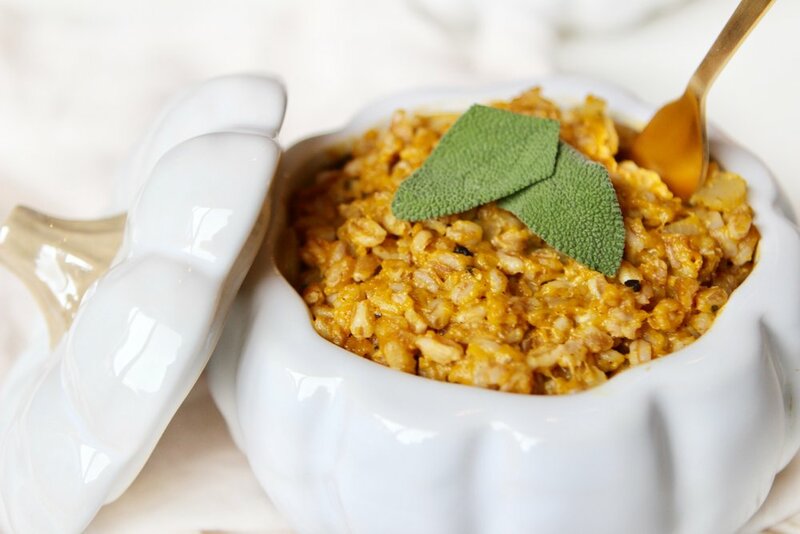 I thought of the idea for pumpkin risotto but I wanted it to border closer to 'healthy' for a weeknight dinner. I considered using quinoa but I felt like it wouldn't give it that same feel and so I decided to use Farro and I'm so glad that I did. It's not a traditional risotto because of the lack of white rice and because I spent a whole of a lot less time simmering. It's like a shortcut version with a better grain. This dish tastes like fall in a (cute, white pumpkin) bowl. I linked everything that I used to make it below, including these adorable pumpkin dishes. Aren't they perfect for Thanksgiving?! Cook the farro in the vegetable broth according to the directions. In a Dutch oven or deep pan, heat up the olive oil over medium heat. Then, add in the chopped onion and garlic. Sautée until the onions are translucent. Reduce the heat to low. Add in the cooked farro, pumpkin purée, salt, pepper and nutmeg to the Dutch oven. Stir to combine. Add in the parmesan cheese and stir for about 3 minutes, or until the cheese is completely melted and the mixture is creamy looking. Top with sage and serve hot.